Left to right; Nick Frost, Karen Frost, Toni Nguyen, Anina Nguyen, and Hue Nyuyen are photographed after the wedding of the Nguyen daughter who is dressed is a full-length red dress with an embroidered gold dragon, a sheer white coat also bordered in gold, and an elaborate red headdress with gold designs. 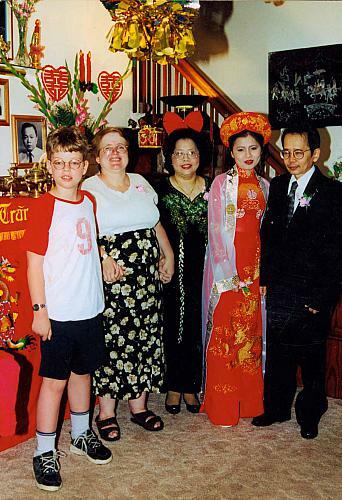 Her mother wears a long black dress with floral embroidery and a red bow in her hair. The bride's father wears a western style suit with a flower in his lapel. Various Vietnamese decorations and art works can be seen around the room.